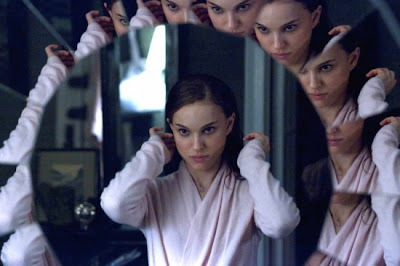 Reel Talk Online: "Black Swan"
The frilly world of tutus, leotards and plies goes down a dark path in director Darren Aronofsky's twisted psychological thriller Black Swan. One prima ballerina's destructive search for perfection lends to a startling performance of one of ballet's most classic tales. Oscar nominee Natalie Portman (Brothers, Closer) transforms her body and seemingly her soul into her performance as prima ballerina Nina Sayers who's just been offered the lead role in the new production of "Swan Lake." Trouble is, rather than just playing the part of the the white swan, production manager Thomas (played by Vincent Cassel) wants her to take on the roles of both the innocent white swan and the darker, more seductive black swan. Faced with the biggest challenge of her career, Nina goes to drastic measures to outperform not only any performance she's ever done but any performance of those before her and after will do. With an overbearing mother (played by Barbara Hershey) who's also an ex-dancer, Nina feels the pressure from everyone. All of a sudden everyone is a competitor--her mother, the aging former prima ballerina Beth (played by Winona Ryder), and the other company dancers particularly Lily (played by Mila Kunis), who Nina is convinced is trying to sabotage her. All the while the show must go on. Aronofsky brilliantly gives audiences a peak into Nina's madness with disturbing special effects and sharp sequences that cause you to feel for Nina while also fear for her as she spirals out of control. Portman is excellent as the dainty swan who--with the help of seduction--turns into a fearless black swan. Kunis, Hershey, Ryder, and Cassell are fantastic as the various dimensions of Nina's world. Audiences won't know who to trust and what is real in this terrifyingly great film that will grab hold of you until the final act. intriguing review. can't wait to see this! I'm anxiously awaiting this one - hopefully it won't take forever for it to come to my city. Your review certainly ups my anticipation. I can't wait to see this. Thanks for reviewing! This review is incredibly on point! The film was a perfect mesh of confusion, sexuality, and suspense mixed with beauty and fragility. It was all put together so deliciously and definitely deserves an A. Everyone in this film went above and beyond their own talent - I'm pretty sure this movie has just become one of my favorites.